Join us for a summer adventure at Sea Turtle Camp! Teens enjoy a hands-on, feet-wet marine biology adventures. While at camp, our teen participants learn about marine science, the ocean, and the sea turtles that call it home! Campers learn how to conserve this precious resource, through our experiential marine biology program. Activities include a wide range of topics, covering marine mammals, conservation, and of course sea turtles! Our campers also visit the Karen Beasley Sea Turtle Rescue and Rehabilitation Center. At the sea turtle hospital, they care for ill and injured sea turtles, helping the turtles make their way to recovery. 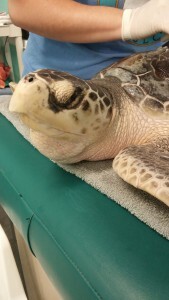 Over 98% of the sea turtles cared for at the hospital eventually return to the sea! These experiences at Sea Turtle Camp influence campers to protect sea turtles and the environment. Sea turtles are large, air breathing reptiles that live in sub-tropical and tropical waters around the world. Leatherback sea turtles also migrate through sub-arctic waters. They belong to the class Reptilia which also encompasses snakes, lizards, crocodiles and dinosaurs – their ancient relatives! Millions of years ago, reptiles were one of the first animals to live outside of the water, on land. These reptiles, like whales and dolphins, later returned to the sea. Therefore, many turtle characteristics result from these animals being adapted to life on land. – Vertebral or spinal column: Reptiles are vertebrates, just like birds and mammals. They must have a spinal column to support their body weight. – Scales: Aid in armoring the body and preventing water loss. 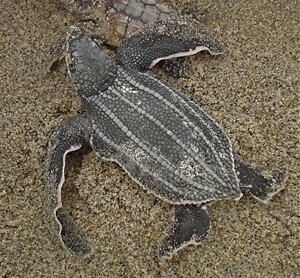 Leatherback sea turtles are the exception. – Air Breathers: Sea turtles do not have gills. All reptiles, like humans need to breathe air in order to survive. – Ectothermic: Reptiles can’t control their body temperature internally, so the external environment largely determines their body temperature. – Internal Fertilization: Sperm fertilize the egg inside the female. Many reptiles lay eggs, including all species of sea turtle. Many of our campers strive to become future marine biologists. 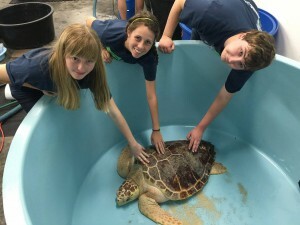 Campers are encouraged to keep learning about sea turtles through research and volunteer opportunities. There is a lot out there for us to do!